The Single Vertical Wood Splitter with Conveyor (Firewood Conveyor) is the baby brother of the Double Vertical Wood Splitter with Conveyor. It offers identical construction, design, and flexibility in a half the package, operating with one working Splitting ram instead of two. Apart from that little fact, it is identical. 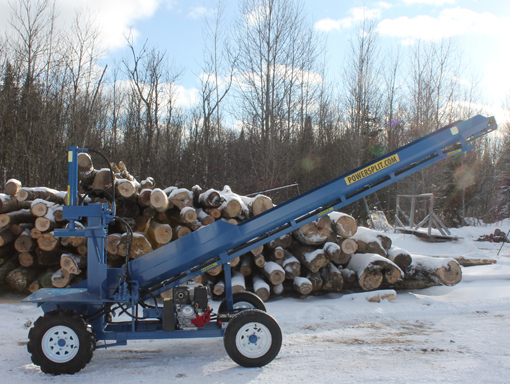 This machine is tailored to the professional firewood producer that either doesn’t have as big a volume of firewood as the Double Splitter owners or doesn’t have the work force to have a 2 workers on the machine at one time. The output of this machine is exactly half of the Double Splitter; it can produce in excess of 2 full cords and hour ( 6 face cords ).